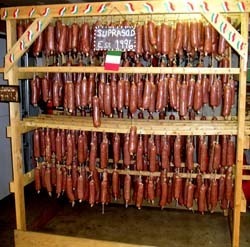 Here at Sopressata.org we support the nationwide homemade sopressata making community. Our goal is to build a nationwide community by providing information and resources from others to help you source materials, share new ideas, recipes, and procedures. We hope that everybody can use our site to their own or to their family’s advantage. If you have any ideas or suggestions for making the website more useful or you just have a sopressata story, photos or video you want to share with the community, please email me at jim@avitra.com or use our Bulletin Board/Guestbook to share you thoughts. See this and other videos on our Community Photos and Video page. Not to long ago I came across some fellow makers that smoke their Sopressata once or twice to taste for about 8 hours each time during the normal drying process. This is happening in the northeast and I must say it was very tasty. I can’t think of any smoked Italian meats at all, can you? Does anyone else do this and what do you know about it? Please go to or Bulletin Board Guestbook and tell us what you think. I probably will smoke some of my normal batch next year. You are listening to the U.S.A. Army Field Band playing the "Tarantella". If you wish to stop listening click the pause button on the media player below. How do you spell Sopressata? Soprassata, Soppresata, Supersata, Souprasatta, Soppressata or even derivatives like Soupie and Soupy. Wikipedia says Soppressata is an Italian cured dry salami. Two principal types are made, a cured dry sausage typical of Basilicata, Apulia and Calabria, the other, a very different uncured salami, native to Tuscany and Liguria. Most native and 1st generation Italians seem to like Sopressata. Tell us what you think go to our Bulletin Board/Guestbook and let us know what you think?